Harley Quinn is in love, so she has her mood changed. With mood change comes a huge makeover. Let's see what she will do! Some girls change their outfit even if they look perfect. 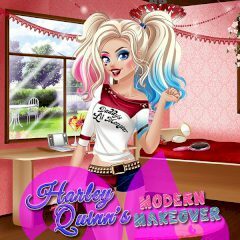 Harley Quinn is another one to do that, but you have to help her to build another, but also perfect look!